What whale songs can tell us about art. Whale song has artistic elements beyond simple communication of information. For example, since each whale theme ends with consistent final sounds, the phrases can be said to “rhyme” in a way akin to human poetry. Is such ornamental courtship behavior just an illustration of the “male quality” valued by hard-line evolutionists? Or does it show that evolution, over thousands of years, is able to produce art if there are no serious predators around? Whale songs include a strange range of sounds, from the bowed bass beats of a giant sub-surface fiddle to the feedback squelches of an electric guitar. But we have trouble perceiving the structure by which the sounds are organized because the notes seem cast out in slow motion, with relatively long silences between each unit of sound. To better appreciate the patterns, we can speed a song up by ten times, allowing us to hear a compressed version… The set of shapes resembles the notation of Gregorian chants written in the tenth century. Granted, I’m just about as likely to sit around listening to 10th Century Gegorian chants as I am to download an entire album of whale songs, but it’s still pretty freaking cool. 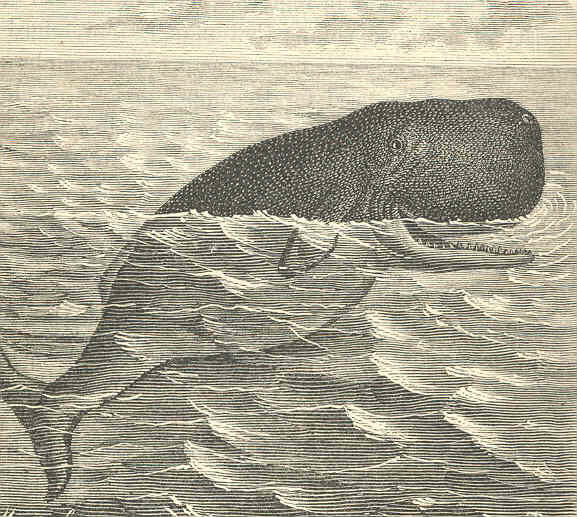 Image: A very goofy whale from Treasures of the Deep: a Descriptive Account of Great Fisheries and Their Products, published in London by Nelson and Sons in 1876. Found via the University of Washington Freshwater and Marine Image Bank (a great resource for lithographs and early American photographs). < Previous By the light of the moon. Next > Clouds like poems and poems like clouds.